Bill Bryson makes me laugh wherever he goes . . . Since I will be traveling over the next five days (work, not adventures), I’m going to pop in a little book recommendation before I head to Nashville. Maybe I’ll write about Nashville when I return but to be honest, when I’m traveling and managing logistics for a client’s conference, I don’t often get beyond the hotel. Fortunately, I’m staying and working at the beautiful Gaylord Opryland Hotel, now owned and operated as a Marriott property. I’ll tell you more about it when I return. Anyway – have you read any of Bill Bryson‘s books? I love travel memoirs and if they’re informative AND funny – so much the better. No one does it better than this writer. Today I’m recommending . . .
Bill was born and raised in Iowa, but worked in England as a young man. He married an English girl and they raised their family in the U.K. for nearly 20 years. When they decided to move to the U.S. to experience life here, Bill retraced his steps from his early days to write notes from a small island. While this book is a hilarious take on Brits and life in the U.K, his irreverent humor is balanced with such genuine affection, I would imagine that his English readers have as much fun, or more, than those of us who may not get every reference and in joke. However, since I hope to go to England next month, this seemed like a great time to pull this gem off the shelf and read it again. I read just a bit last night and was not disappointed. Bill Bryson is one of the funniest writers around – and that’s not an exaggeration, either. 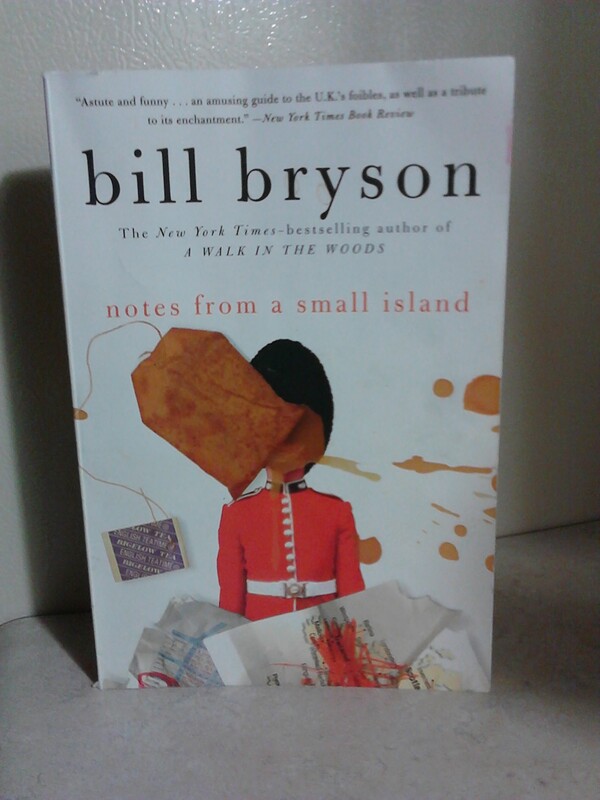 So, what I do know is that this book, like all Bryson’s other books, including In a Sunburned Country (misadventures in Australia) and A Walk in the Woods (slapstick on the Appalachian Trail) to name just a couple more, leave me gasping with laughter and hoping my Poise pad can handle the hilarity. I’m counting on this one to keep me giggling and snorting at the gate and on the plane between Cleveland and Nashville on Saturday. In the meantime, look for this book or ANY book by Bill Bryson if you’re in the mood for a deliciously funny read this weekend. If I had a reading blog I’d call it weheartbillbryson.com. He’s that good. This entry was posted in Travel, Uncategorized and tagged Bill Bryson, England, Gaylord Opryland, humor writing, Nashville, travel memoir, travel memoirs. Bookmark the permalink.